The I-7561 is a cost-effective module for transferring serial data via USB. It allows you to connect your serial devices to systems that use a USB interface. Connecting the I-7561 to a PC, you get one RS-232/422/485 port. Like the I-7520A, the I-7561 contains "Self Tuner" chip auto-tunes the Baud Rate and data format to the RS-485 network.The I-7561 module derives its power from the USB port and doesn't need any power adapter. It also features a high-speed 115.2 kbps transmission rate, and supports various O.S. 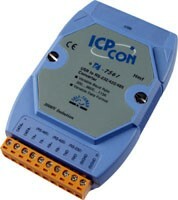 independent RS-232/422/485 Ports.